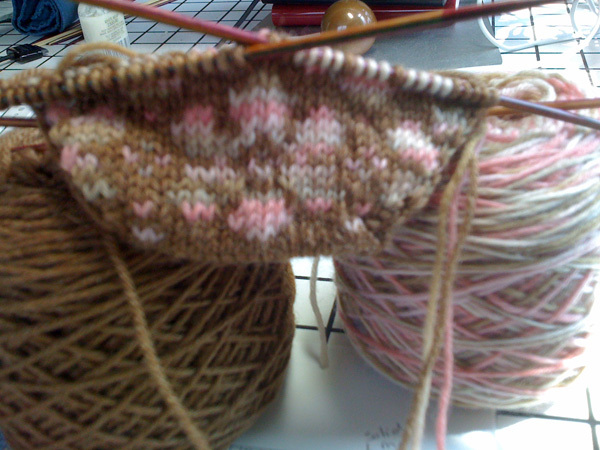 This week I started test knitting the Flower Power Socks I mentioned last week. I love the way the flowers are turning out. Test knitting is fun, but can also be a challenge. You get the pattern for free, which is a plus, but you also get to be the one to find all the errors as you work through it on a deadline, a definite minus. This designer has done an excellent job at writing the pattern the first go around, so there are not many true errors in the pattern. I also realized that the holiday knitting I have started was going to have to remain a secret until Christmas. This just won’t do. I have to share what I am working on, or else, why blog? LOL So, I figured out that if I just show them on my blog without any specific recipient details, it may keep those potential recipients who read my blog from knowing who they are for. This is the best solution I could come up with for this dilemma. Of course, the baby and kid items are going to be obvious, but the socks, mittens, etc. shouldn’t be so obvious. On the health front, my doctor, called me on Thursday and wanted to know why the oral surgeon had me come to his (my doctor’s) office for blood work. Without my requesting it, he said I shouldn’t need a transfusion before I have the tooth extracted and said he would contact the oral surgeon on Monday to let him know. I am thrilled to report that they hashed it out and I will not have to have a transfusion before the tooth extraction. I do have to agree that if it looks like I am about to bleed to death that I will go to the ER for platelets right away…duhhhhhh…. I love my doctor! He just made my Christmas gift list!! This week, the kids come to visit us on their way to Disney World. It will be great to see them and spend some time with them without being in the hospital. I am really looking forward to that! Bad enough enduring the dental work without adding to it. Yippy-skippy for pro-active doctors! I had to have ALL my teeth extracted a few years ago due to medical complications – and they almost lost me on the table – not fun. But you do adjust, and I am fine now. Dentally, at least. Good luck with the extraction and think positive.